End of the sixties, at the beginning of the seventies was in Nordend the industrial area extended. Between Angermünder Chaussee (later Straße der Jugend, simultaneously long distance traffic road no. 2) and Poratzstraße was a road connection created, the Industriestraße (today: Neue Straße). After at the beginning only the VEB Kraftverkehr Eberswalde-Finow and the animal clinic in Nordend had its seat, added later in the more eastern part of Nordend the VEB Kraftfahrzeugsinstandsetzungsbetrieb Eberswalde (motor vehicle repair enterprise), the Straßenmeisterei Eberswalde (road maintenance staff), the Produktionsgenossenschaft der Dachdecker "Fortschritt" (producers' cooperative of the roofers), the VEB Tiefbaukombinat Frankfurt/Oder (civil and underground engineering combine), the Institut für Tierhygiene (Institute for animal hygiene), the VE Dienstleistungskombinat Eberswalde (supply of services combine) as well as the Auslieferungslager des Schlacht- und Verarbeitungskombinates Eberswalde/Britz (SVKE) (distribution center of the slaughtering and processing combine). A connexion of these undertakings to the commuter traffic made itself necessary. After the municipal council of the city Eberswalde on 20 June 1973 gave the administrative decision to the building of a single-lane trolley system from the level crossing Nordend, over the Straße der Jugend, Industriestraße to the Poratzstraße, the Kraftverkehr constructed short-term the trolley system in internal activity. Due to the scantily building development masts had to be set for the mounting of the trolley system. The existing turning loop Käthe-Kollwitz-Straße/Helene-Lange-Straße/Rosa-Luxemburg- Straße should be originally further used. Because however the mercury electric rectifiers of the substation had reached their achievement capacity, the turning loop Käthe-Kollwitz-Straße/Helene-Lange-Straße/Rosa-Luxemburg- Straße was dismantled in this context. In the Poratzstraße the two-lane trolleybus distance was built back to a single-lane trolleybus distance. On 07 October 1973 was inaugurated for a better traffic development a new single-lane distance, Straße der Jugend- Industriestraße (today: Neue Straße)-Poratzstraße, in Nordend. The new building distance had a length of 1,9 km. The length of the line Westend-Nordend amounts to now 5,2 km. The bus stops Kiefernweg, Käthe-Kollwitz-Straße (former final stop Nordend) and Rosa-Luxemburg-Straße were closed. For it the bus stops Dr.-Gillwald-Höhe, Tiefbau (civil and underground engineering) and KIB (KIB is the abbreviation of motor vehicle repair enterprise.) were added. 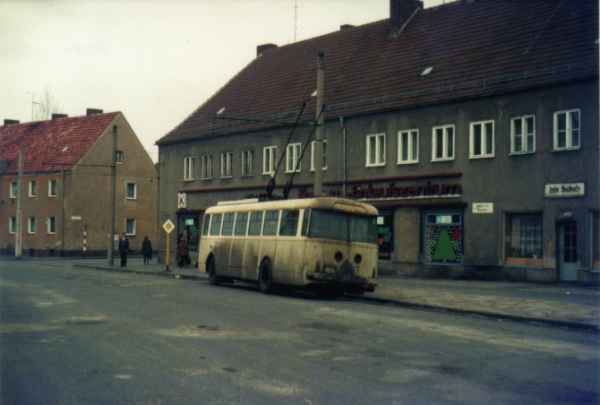 The bus stop Poratzstraße was transfered over the road and was therewith the new final stop Nordend.